"From the Battle of Britain onwards, the Luftwaffe became increasingly over-extended as theatres of operations grew and new fronts were opened, often covering vast areas of territory as in the Desert and Russia. 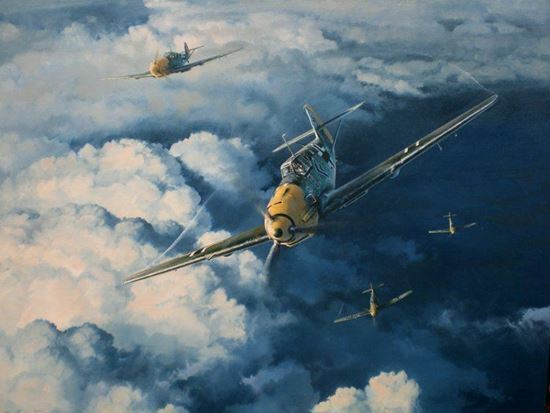 Spread over so many fronts, so much was asked of its pilots....." Adolf Galland. The Luftwaffe fought on every front and in some of the worst conditions of WW2. By 1943 it was already outnumbered and having to combat increasing raids on Germany from the Western Allies. In the East, a rejuvenated Soviet Air Force was throwing massive numbers of bombers and fighters at an already over-stretched Luftwaffe. Despite this, the German fighter pilots fought on in their Me109's and Fw190's. Some even managed to fly in combat with the Me262 jet. The Prints have been signed by no less than 10 Luftwaffe Aces, who have an astounding 1225 victories between them! The Print measures 30.5 x 27 Inches and is in Excellent Condition and comes with its CoA. This is now a rare Secondary Market Print.